In Italian, a language of such beautiful color, "Indaco" translates as "Indigo." And, if there is anything that this recording is, it is indeed colorful, full of beauty, rhythmic variety and mood. 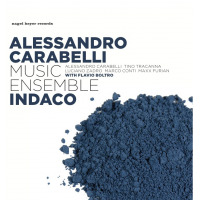 Pianist and composer Alessandro Carabelli and his Ensemble offer 14 selections where texture and color predominate. This is highly intelligent and inviting musicwithout any appearance of pretentiousness. Each selection draws one's ear in, and, in the best Italian tradition, one's heart. Leader Carabelli, who composed all of the fine selections (save bassist Conti's "Index" and "Dig It," which was co-composed with Conti) has a pen that inks neat, memorable themes (for example the gorgeous ballad "And Then" performed by alto man, Tino Trancanna). Carabelli's orchestration and wise usage of the ensemble's instrumentation is superb throughout and a joy. Indicative of that is "Starlet," a triple-metered vai a dormire, caro bambino lullabye that's offered over a gorgeous Conti arco bass. "Living Materials" is a Latinesque thing with soprano sax and guitar at play. The title cut send us Conti's booming bass, dancing with Furian's stick work before Trancanna's sweet alto sings with the ensemble and before Luciano Zadro's guitar and Boltro's tasty rides. The musicianship and artistic expression across "Indaco" is absolutely outstanding ("Le Onde di Albi," "Gold and Blues," "Next Life"). The soloists make the most of the rhythmic and harmonic textures which they are offered. There's no grandstanding in this team effort. "Goodnight Mrs. Giulianna" sends the signora off with a sublime Cavatina played by Zadro and Carabelli, leaving us with an ghosting image of herand this album'sfully realized beauty. Indaco is a superb and enjoyable efforta very unique recording that will aesthetically intrigue and stimulate, especially with one's eyes closed and ears and mind wide open. Track Listing: Index; Fig It; Frames; And Then; Starlet; Living Materials; Indaco; Northern Winds; Circle; Le Onde Di Albi; Gold and Blues; Next Life; Parallel Universes; Goodnight Mrs. Giuliana. Personnel: Alessandro Carabelli: piano; Flavio Boltro: trumpet; Tino Trancanna: saxophones; Luciano Zadro: guitar; Marco Conti: double bass; Maxx Furian: drums.